With dramatic falls of over 2% on US markets last night, European traders will have reached their desks with some trepidation this morning. They will have breathed a sigh of relief as financial markets are showing some resilience this morning. The FTSE100, CAC and DAX opened up around 0.5% higher and while this won’t eradicate the losses from yesterday, it is certainly a start in the right direction. Aside from the Chinese stock market plunging 6% yesterday, there weren’t any major catalysts to point to, aside from the fact that stocks had run up too far too quickly. Absent of any new major stimulus, the bulls ran out of steam and finally gave way to the sceptics who were selling the rally with no small amount of pain along the way. Today we have UK CPI and RPI at 08.30. These two inflation measures could see some strong reactions in the FTSE and pound. At 12.30 GMT we have US building permits following by PPI. 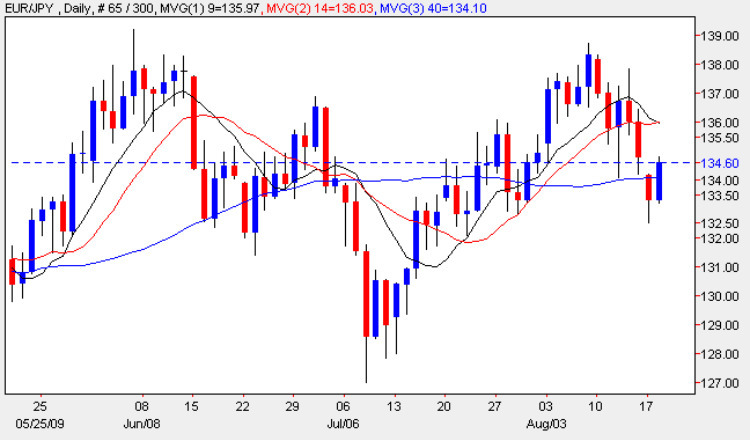 Forex markets are attempting to reverse the major movements seen yesterday and late last week. Yesterday the yen and the dollar reigned but now the euro, pound and Aussie dollar are fighting back. The Euro/Yen in particular looks strong today, recovering most of yesterday’s losses. This rally could be muted though until stock markets really grab the bit between the teeth as a sign of returning appetite for risk. A no touch higher could be the best way to play this, with the barrier set just above yesterdays opening level at 135.25 for one day.